Corporate Roast for a Company Tug of War Competition! A publishing company Hog Roast Cambuslang catered for recently, gave their staff the opportunity to sort out their differences once and for all, by organising a tug of war contest for all of company’s departments to compete in against each other! It was all meant to be in good fun of course and a nice way for their staff to let off a bit of steam after a busy few months. To make it even better, they decided to ask us to provide one of our increasingly popular corporate buffets to feed both the victors and the losers of the contest afterwards! The event organisers opted for our delicious slow-roasted organic chicken, rather than pork, served with our signature chipolata stuffing and homemade onion gravy, accompanied by locally-sourced seasonal vegetables and rosemary new potatoes. Most definitely a worthy feast for all the tug of war contestants and they couldn’t wait to try it! The Hog Roast Cambuslang arrived at their premises long before battle was due to commence and were met by Debbie, who was in charge of the proceedings. 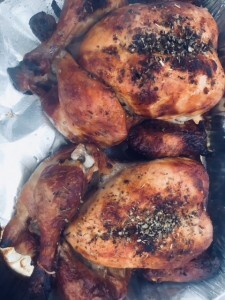 We set up on the lawned area outside their offices where the event was taking place, and in no time at all, our superb quality chicken was on the spit roast and would be ready to be served at 1pm precisely, as requested! With the seasonal vegetables and roast potatoes also being taken care of by our proactive catering assistants, the employees began to make their way outside, lured by the smells coming from our cooking area and ready for action! Things got very competitive all of a sudden, as the tug of war got underway, with the marketing department emphatically taking the first round and pulling their way through to the final! The atmosphere became increasingly more animated as one by one the teams were eliminated, until only Marketing and IT were left standing! Amid a barrage of cheering and (mostly!) good natured booing, the Hog Roast Cambuslang team stayed focused on presenting our beautifully cooked food, ready for the 1pm feast. As we were putting the finishing touches to everything, the wildcard IT department pulled off a shock victory, and as their reward they got first dibs on the buffet! There was of course plenty for everyone, and from the first slice of chicken to the last, we received compliment after compliment about the flavour and succulence of our meat, which everyone deemed a fantastic alternative to a traditional hog roast!